Breaking the Line: How football’s racial breakthroughs of 1967 paved the way for 2013. In 1967, 20 years after Jackie Robinson broke baseball’s color line, there were no black quarterbacks in the NFL. Here’s how history was made. 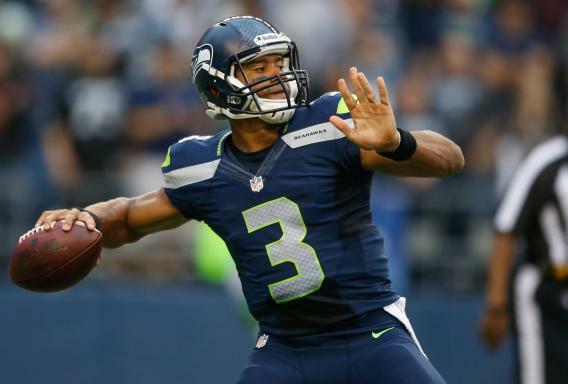 Seattle quarterback Russell Wilson drops back to pass in a preseason game. All eyes will be on Wilson and Washington’s Robert Griffin III this season. This piece is adapted from Breaking the Line: The Season in Black College Football That Transformed the Sport and Changed the Course of Civil Rights. Just before kickoff on a Saturday night in October 1967, in a football stadium so hostile to visitors it was nicknamed “The Hole,” James Harris of Grambling tossed some warm-up passes. The Tigers had come to Nashville to play Tennessee State, which also had a star quarterback in Eldridge Dickey. He was standing almost back-to-back with Harris at midfield, firing off his own practice throws. Two black scouts for the NFL, Tank Younger and Lloyd Wells, watched them and placed a bet on who would have a better game. That same month in Tallahassee, the Florida Board of Regents assembled for a meeting at Florida A&M, the black university in the state capital. The regents, one part of an entirely white state government, held absolute control over FAMU, as it was known. While those regents treated the school’s Ivy League-educated president, George Gore, like a supplicant, they had been adroitly cultivated over the years by FAMU’s legendary football coach, Jake Gaither. He was working the room at this meeting. The college season, meanwhile, has begun with Alabama seeking its third consecutive BCS championship, fielding a team with dozens of black players. The one team to beat Alabama last year—and considered among the top threats to its supremacy this year—is Texas A&M, which has a black head coach, Kevin Sumlin. Before the changes set in motion in 1967, none of these scenarios would have seemed possible. The conventional wisdom in pro football was that no black player was intelligent enough to play quarterback. Black quarterbacks were routinely shifted to wide receiver or defensive back, the better to utilize their “natural athletic ability,” as the bigoted idiom put it. No black men coached for any NFL team, much less served as a team executive. As for the colleges, despite the fact that segregated state universities like Alabama, Georgia, Mississippi, and Louisiana State had begrudgingly admitted black students under federal pressure, all of them had deliberately kept their football teams all-white. “You’re Dixie’s football pride, Crimson Tide,” went Bama’s fight song, and indeed triumph on the gridiron was eagerly interpreted in the South as proof of white supremacy. Not that the North was above reproach: Even there, only a couple of college teams had deigned to hire a black assistant coach. What changed the course of football history—and, given football’s role as a kind of civic religion in America, the nation’s history—were two sequences of events that unspooled in 1967. The showdown between Grambling and Tennessee State was more than the confrontation between two of black college football’s most powerful teams and most accomplished coaches, Eddie Robinson and John Merritt. It was also a personal showcase, and a means of comparison, between the nation’s best black quarterbacks, Dickey and Harris. Harris, in contrast, sublimated his downfield passing skills to Eddie Robinson’s wing-T offense. Grambling won games in the style of Vince Lombardi’s Packers, by executing a fairly limited playbook to invincible perfection. But outside of game days, Robinson had been preparing Harris for a pro-style passing offense, with the goal of making him the kind of classic drop-back passer who couldn’t be forced to change positions. The son of a minister and a nurse, Harris had all the necessary intelligence and judgment to play quarterback. And Grambling’s sports publicist, Collie J. Nicholson, had been running Harris through mock interviews to steel him for the hostility that would surely await the NFL’s breakthrough black quarterback. In the game against Tennessee State, a team that could burn out a scoreboard, Robinson was finally persuaded by Harris and backfield coach Doug Porter to open up the offense. Harris responded by throwing for 264 yards and three touchdowns, the final one winning the game with less than a minute remaining. Dickey, meanwhile, was intercepted five times. Ultimately, Dickey did become a first-round draft choice of the Oakland Raiders in 1968. He then met the fate of so many black quarterbacks before him. Despite outplaying another rookie, Ken Stabler, in the preseason, he was turned into a flanker. His pro career ended after three years. Like other black quarterbacks whose dreams were similarly dashed—Marlin Briscoe of the Denver Broncos, Joe Gilliam Jr. of the Pittsburgh Steelers—Dickey fell into despondency and drug addiction. Harris was drafted the year after Dickey, and not until the eighth round. That snub was surely the league’s response to the vow by both Harris and Robinson that this quarterback would only play quarterback. Harris was waived after just three years with his first team, the Buffalo Bills, but after catching on with the Los Angeles Rams in the mid-1970s, he posted a series of firsts: first black quarterback to regularly start, to be chosen team captain, to bring his team (twice) to the conference title game, to be selected for the Pro Bowl (where he was MVP), to lead the conference in passing efficiency. In the short run, Harris’ career ended bitterly. The Rams drafted and traded for a series of white quarterback to displace him—Pat Haden, Joe Namath, Ron Jaworski, Vince Ferragamo—before finally dealing him away to the San Diego Chargers. But the door that Harris had opened stayed open. As he was being dumped by the Rams, another Grambling quarterback, Doug Williams, was being drafted by the Tampa Bay Buccaneers, and would later win a Super Bowl for Washington. From Williams to RG3, every black quarterback owes his opportunity to James Harris. In the case of Jake Gaither and the Florida regents, the FAMU coach had a very clear agenda on that day in October 1967. During decades of hiding his private support for civil rights from public view—indeed, of buddying up to a series of segregationist governors—Gaither had been building up his political chips. In 1967, he cashed them in. He wanted permission for FAMU to play against a white college’s team, the kind of game that had never occurred in the South. He needed state approval for it. The regents granted Gaither’s request, but they left no written record of the decision. What would happen if FAMU beat Florida or Florida State or Miami? There could be race riots. The regents didn’t want their fingerprints on a disaster. Or, for that matter, on an idealistic blow against segregation. It took Gaither two years to find a white team to take up his offer. Finally, in 1969, the young coach of Tampa University, Fran Curci, did. A transplanted northerner, an Italian Catholic who himself felt alien in the South, Curci had taken the Tampa job on the promise he could integrate its team. So playing FAMU contributed to his goals as well as his values. The FAMU-Tampa game drew a capacity crowd of more than 40,000, equally divided between white and black. The contest went down to the final play. And when FAMU won, it proved several vital points. First, Gaither had answered the white skeptics who said he’d built up his record by playing second-rate black teams. (Tampa under Curci had beaten major-college teams.) Second, a tense game with a racially mixed crowd went off without incident. For all that Jake Gaither and Eddie Robinson achieved, neither man ever received a job offer from an NFL team or a mostly white college. Robinson, a man not given to complaint, once remarked that the only time in his life he was introduced simply as an American was on a visit to Japan. Gaither, who stopped coaching in 1969 and died in 1993, has largely fallen out of sporting memory. Yet the influence of what Robinson and Gaither, Grambling and Florida A&M did in 1967 informs and infuses the football we are watching in 2013.